Alright, so I have recently finished watching "Game of Thrones", and I must say i'm a really big fan, so I decided it would be a lot of fun to make a map of it. Yes, I realize that we already have Several good Game of Thrones maps, but I feel that there must be soemthing unique I can add to the scene, even if it is only a blue background. I was really inspired by the "A Song of Westeros and the Free Cities" map, which has by far become my favorite map since I can finally play diplomacy games on it, and one of my goals was to recreat it on a worldwide scale. Review by Gallien on 4/14/2016. This is a great map and a very stylish one! I think it can become a major rival to the classical westeros maps but it needs to be fixed a little bit. - A missing connection in Blackmont, western Dorne. - Center points of 2 provinces near the Thousand Isles are placed outside of their territories. - Without a bonus that includes the white walker start only (the "9" territory) it is very hard to balance them. It would make things much easier if that bonus is added. This map is already great but it can become even better and I hope it will! Review by Belgian Gentleman on 10/24/2015. Very progressive! 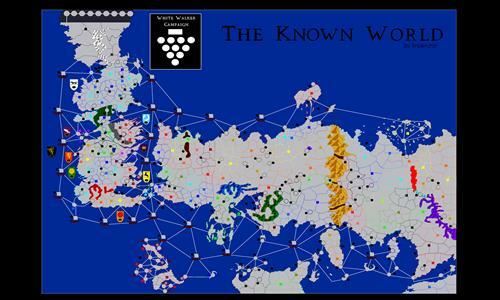 This map is the expansion of the Westeros Diplomacy map created by Dameon. It serves as a great applicability towards the Game of Thrones fans in terms of roleplay. Good job! Although maybe it would have been recommended to add scenario's in the distribution panel. Thanks for the feedback, I'll definitely add some scenarios when I do an update! Review by Nathan on 3/8/2016. I rated this map (5 stars) a while ago but I wanted to take the time to review it thoroughly. Simply put, it's a great map. It fairly balances the value of territorial regions with the wealth of the great cities of Essos and Westeros. I think it compares very favorably with the other excellent Ice and Fire maps on Warlight. I understand what the maker was going for with the negative bonuses on Moat Cailin and, to a lesser extent, Skagos. However, given the extreme advantage conferred on whomever possesses the Neck in the actual series, I would have opted to give Moat Cailin itself positive bonus but added "approach" territories to the north and south with negative bonuses to reflect the cost and difficulty of besieging and assaulting the place. (It seems hard to justify a negative bonus for the Moat when Always Winter grants a positive bonus). It also seems that Hardholme and Eastwatch should have sea access without having to go through Skagos. But that is petty stuff. Great job, in all. Review by Den-Sel on 9/2/2017. This is a strange map. I've played it twice and the bonuses for individual cities overwhelm the bonuses for territories. Many cities have typical bonuses of 3 or 5; to get with regular land territories, you need to win 4-6 of them. So, there's no advantage going for territories. You just accumulate single cities (preferably, by sea raiding) making sure to occupy some strategic chokepoints, and that's the game right there. I found it very unbalanced in that sense. Review by A_B3 on 3/4/2018. Review by Mephistophele on 7/20/2018. This is one great Map! Perhaps the bonuses are a bit unballanced between East and West, because facing the A1 that started far in the East while I started from the Wall and Winterfell I sensed like I had one or two hundred more income than him. The White Walker could be intriguing just tocounter the West/East income gap (forcing Westeros players to clean it not to be hindered)... for a starting point it is also pointless. Other thing that can move things, could be a way to come west directly from the East: from Eastern Thousend Islands to Iron Ship II in the North and from Ulos to Redwyne Ship in the South. Review by RageKingGrave on 10/2/2017.